Hey all! We’re ringing in Monday with another look at our in-depth character backstories. This week’s piece features Sadira. If you recall, she was the first new character introduced to the KI lineup back in 2013. How does her story weave in to the web that is Killer Instinct canon? This is the stuff my nightmares are made out of. I’m screaming inside. But I sucked it up, and looked at the picture and did research. Thanks though, that I know now something is gonna be done with Sadira’s Jumping. So, Hisako’s first story match is canon and Cinder’s last one isn’t. For the hint, something about jumping. Maybe a walljump or a super jump. I did. And I’m proud. Jk. Did you know that every time they try to dissect a Salticidae’s brain, they explode because they’re under so much pressure? The spider jumps with a tethered line in a pounce that grabs its prey and hopefully returns to its original spot, but with a safety line if not. I suspect a 0-frame start-up leaping Shadow attack to compliment her escape move. Without Shadow, ground to air command grab? Cool to know Sadira is a wild card, loyal to her survival, nothing else. Only a righteous crusader is more dangerous. You know, I was hoping before reading this story that I would see a full character around Sadira, more than just the generic mercenary that she always looked to me. And while the backstory has certainly been expanded, her personality has not. Mercenary or Killing Machine, same difference in my eyes. Also, Sadira’s getting another jumping maneuver, like the Web Cling?..Her mobility is already the best in the game next to Orchid and Maya, so making it better was not my expectation. I am curious, though. Mm. So a massive retcon of S1 Sadira backstory then? Wasn’t Sadira hundreds of years old or something? Meh. I think I liked that version more. Which is a shame, because this is the first of the Monday reveals I was actually looking forward to, and turns out to be the first one I was disappointed by. Guess it’ll be interesting to see what they do to her jumps though. Apparently one breed on jumping spider will attach a silken tether to the ground before i jumps or hang from it Spider-man style. That may be a potential change for Sadira but no one can be positive. Also, I just realized that at this rate we will have everyone’s backstory by February (assuming they are doing this for season 2 characters as well). So if what Sadira stole from glacius’ ship was some kind of tech that she and Aria needed his DNA to activate some kind of portal, what was it that Kan-ra stole from glacius? I was hoping she’d be still alive after Cinder defeated her. Sadira’s real name confirmed to be Peter Parker. I like the back story. Makes her look truly evil, which is nice in comparison to all the relatively good aligned characters. 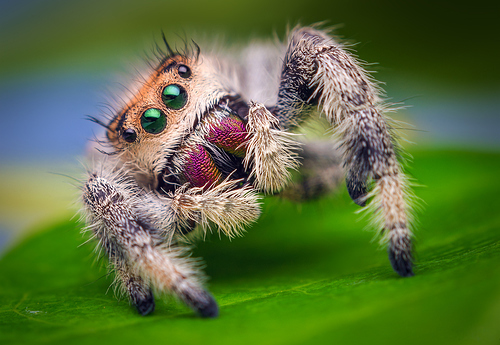 Interesting to see jumping spiders as an inspiration, seeing as she’s already very jumpy. Good to see she’s getting something to make her air superiority more noticeable compared to the other air happy characters like Cinder. Maybe an air grab?